Our aim is to empower the patient through education, training, sharing the knowledge of other experienced patients and mentoring, so that life with a prosthesis becomes normal and not limiting. Every patient is different. Bodies change. Lifestyles change. 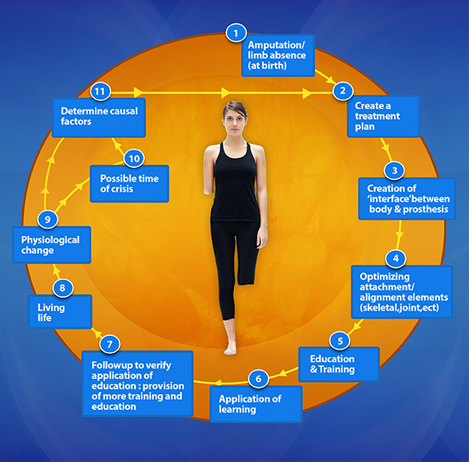 Where each patient is in the cycle of their life with a prosthesis is different. This Cycle of Treatment outlines the cyclical nature of prosthetic treatment. Living with a prosthesis is a life-long journey. There are times when the journey is easy and life is just rolling along. Then there are times when you are in crisis (you are shrinking, something is broken, it just doesn’t feel right) and you need to visit your prosthetist to help you manage this crisis. Like in the rest of your life, it is sometimes easy to ignore or put-off the things you don’t want to deal with, until the last minute. For an amputee this can mean a huge interruption in your life. Taking a proactive approach is the best way to get back into life sooner. Our philosophy of care includes regular follow-up appointments, maintenance programs for feet and knees, and measures to make sure that you have what you need to make your life with a prosthesis manageable.